Just wrap, strap and relax. Bodi wrap soothes and comforts sore, aching back muscles, delivering up to 12 hours of pain relief. Designed to be worn under clothes. Stretchable belt allows you to move freely, while keeping the heat where you need it most. Exclusive formula works with your own circulation to spread the warmth. Pads are air-activated, odorless and nonmedicated. Open the package and expose the pad to the air. No kneading or shaking is necessary. The pad will heat up within 15-30 minutes after opening. 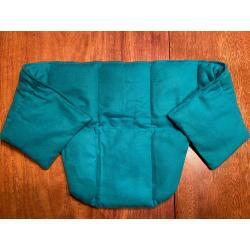 Insert one or two heat pads in pockets of belt. Wrap belt around waist with pocket openings facing up. Fasten belt with pads over area of discomfort, printed side of heat pad towards body. Once the pad has cooled or you are finished using it, remove from belt and discard. Keep belt for use with remaining pads. Only use pads with belt provided. Never place pads directly against skin, as burns may occur. Remove the belt and pad immediately if they become too warm or uncomfortable. Iron powder, water, activated carbon, vermiculite, salt, super absorbent polymer, Purge natural mineral powder. Supervision is required when using this product on the elderly, children, and physically disabled or handicapped individuals. Do not use more than 12 hours in any 24-hour period. Do not use on infants, on frostbitten or desensitized skin, while sleeping, or on bruising or swelling that has occurred within the last 48 hours. Burns may occur if not used correctly. Check your skin for any signs of irritation. Do not eat. In case of ingestion, consult a poison control center immediately. Do not use with medicated lotions, creams, gels, ointments or in combination with other heating devices. Consult your doctor if you are diabetic, have poor circulation, have rheumatoid arthritis or are pregnant. For external use only. Do not puncture pad. In case of accidental eye contact with contents, rinse thoroughly with water. DO NOT MICROWAVE HEAT PAD. REMOVE THE HEAT PAD IMMEDIATELY IF THEY BECOME TOO WARM OR UNCOMFORTABLE. NEVER PLACE PADS DIRECTLY AGAINST SKIN AS BURNS MAY OCCUR. SUPERVISION IS REQUIRED WHEN USING THIS PRODUCT ON THE ELDERLY, CHILDREN, THE PHYSICALLY DISABLED OR HANDICAPPED INDIVIDUALS WHO MAY HAVE DIFFICULTY REMOVING THE BELT OR HEAT PAD BY THEMSELVES. DO NOT USE ON INFANTS. DO NOT USE MORE THAN 12 HOURS IN ANY 24 HOUR PERIOD. DO NOT USE ON FROSTBITTEN OR DESENSITIZED SKIN, OR ON BRUISING OR SWELLING THAT HAS OCCURRED WITHIN THE LAST 48 HOURS. IF NOT USED CORRECTLY, BURNS MAY OCCUR. CHECK YOUR SKIN PERIODICALLY DURING USE FOR ANY SIGNS OF IRRITATION. IF SKIN IS IRRITATED, REMOVE THE HEAT PAD. DO NOT EAT HEAT PAD. IN CASE OF INGESTION, CONSULT A POISON CONTROL CENTER IMMEDIATELY. DO NOT CUT THE HEAT PAD. DO NOT USE WITH MEDICATED LOTIONS, CREAMS, GELS, OINTMENTS, OR IN COMBINATION WITH OTHER HEATING DEVICES. CONSULT YOUR DOCTOR PRIOR TO USE IF YOU ARE DIABETIC, HAVE POOR CIRCULATION, HAVE RHEUMATOID ARTHRITIS, OR ARE PREGNANT.